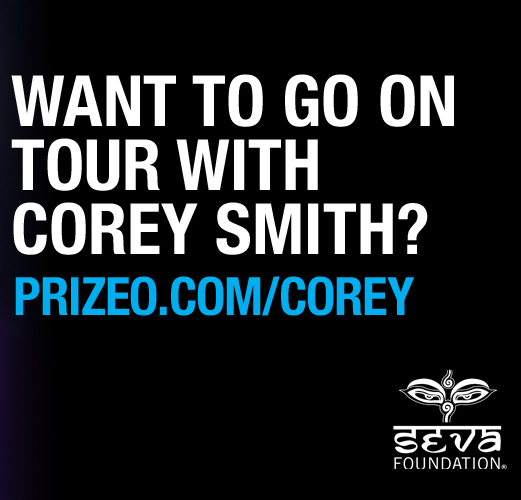 You and 9 friends could win a two day trip to go on tour with Corey Smith in your own tour bus! Let’s go on tour together! You and nine of your friends have the chance to go on tour with me this year. We’ll hook you up with a tour bus and you’ll be part of the crew for two cities. You’ll be at both concerts and both soundchecks AND I’ll come hang out on your bus for part of the trip. I’m working with Prizeo on this to help support the Seva Foundation. All it takes is $20 to give the gift of SIGHT to people all around the world. It’s a beautiful thing you’ll be doing by supporting this campaign. To win the trip, all you need to do is donate $5 and you’ll be entered to win. The more you donate, the more chances you have to win. So if you donate $20, you’ll be giving someone sight AND you’ll be getting four chances to win. There are a bunch of great rewards at all the different donation levels, too. I’ve got a new campaign t-shirt I’m excited for you to check out and there are signed lyric sheets and guitars available. Seva’s work is absolutely incredible and I’d be honored to have you join me in supporting their work. Seva Foundation started as a small group with a big idea, and the idea was this: To be fully human, we must translate our compassion and concern into useful service. That simple statement conveys something about the nature of compassion that is expressed in most spiritual traditions around the world — that compassion is not just about helping those less fortunate than ourselves, it’s about the realization that we are all connected as one human family. That sense of compassionate service motivates all of Seva’s work, as we build sight-saving programs that support people around the world in their efforts to build healthy communities.